Home > Tapes and Adhesives > Specialty Tapes / Adhesives > 3M Scotch 568 Positionable Mounting Adhesive 24 in x 50 ft.
Great for mounting prints to wood panels. The product works great for our presenations. I will definitely order again. Thanks NHS for having it in stock. Excellent mounting adhesive. Simple, easy to use. Mount pictures without the use of heat. 3M 568 is a great product. We use it to mount photos to mat board for all types of displays. It is very easy to use and superior to dry mount press or spray adhesives. I love this product for mounting large photographic prints to foam board for framing. It is easier to work with than spray and no fumes. I use an Olfa knife to cut the adhesive around the prints. 3M Scotch 568 Positionable Mounting Adhesive 24in x 50ft is a transparent dry mounting adhesive for professional artists and framers. Neater and cleaner than spray adhesives. It is much better than rubber cement. Initially repositionable, ideal for heat sensitive paper. Acid-Free, Photo-safe. Used for back-mounting of pictures. No machine required. Formulated for sensitive papers and colors that can't hold up to heat, as well as thin papers and digital printouts. 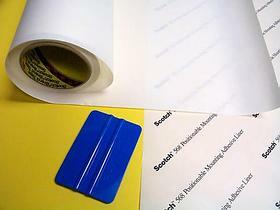 Adhesive comes complete with release paper and plastic squeegee. 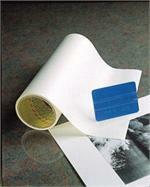 Easy to use 3M 568 provides a dry technique that lays flat & does not buckle or warp the paper. With this product, no ruined prints, no bubbles, no loose edges. Reposition the print on the mounting board until you make the bond permanent with the provided squeegee. Use a "self-healing" cutting mat, and a utility knife with a fresh blade. To cut the adhesive sheet to size, lay the print on the adhesive sheet so that it hangs over the adhesive sheet on two edges. To cut the other two edges to fit, angle the blade in under those edges, so that the adhesive sheet is just a bit smaller than the print. Then, as the enclosed directions state, squeegee the adhesive sheet to the back of the print to transfer the adhesive, peel off the backing material, position the print on the mounting board, and when satisfied by the position, squeegee the print to the board to make the bond permanent. Plastic Squeegee included for easy application.